Holiday Kup Kollars will keep your delicious Silk Nog cold! Eggnog is a popular holiday drink made with milk, eggs, and sugar - and sometimes served with rum or brandy. It’s spiced with nutmeg, cinnamon, or allspice. For those of us who have a problem with milk or eating too many eggs, I’ve found a wonderful beverage called Silk Nog. It’s like liquid dessert! For variations, you can add coffee or chocolate syrup to Silk Nog. You can use it to replace the liquid in cookie, cake, and bread recipes or to cook your favorite pudding recipe. 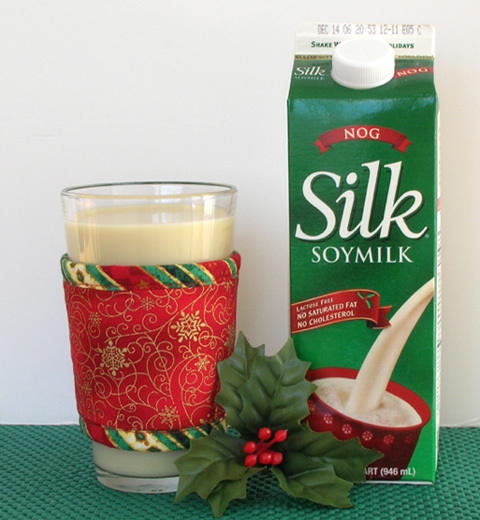 Now is the time to treat yourself because Silk Nog is sold only during the holiday season!